Background on current status: The President Apartments was recently added to the Municipal Inventory of Potential Historic Sites (category B). On December 16, 2005 the new owners submitted a land use application to the city to allow redevelopment of the site and in March 2006 they applied for a demolition permit. On March 30, in response to strong support for the President from the community, CHI, Alderman King and many individuals, the owner had a change of heart and the demolition permit application was withdrawn. In June the community and CHI members were shown an innovative new proposal that would save the President Apartments and incorporate it in a new development. On July 20, 2006 a new land use application was made for redevelopment including preservation of the historic resource. This land use passed in March 2007. A development permit application was made in May 2007 and was going to Calgary Planning Commission in February 2008. The history of the President is below the photo. 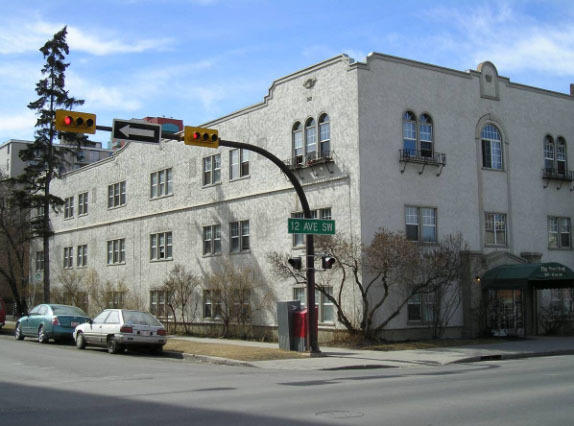 The President Apartments is a three-storey building in Calgary’s Connaught-Beltline district. 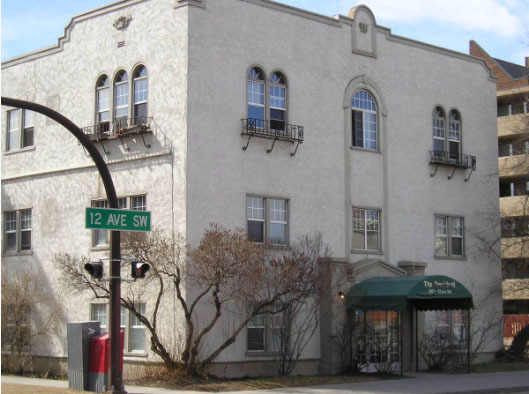 This apartment building was part of a mini-boom in Calgary at the end of the 1920’s and was designed to appeal to upper class tenants. It was built by Samuel Diamond, the nephew of Jacob and Rachel Diamond, who were Calgary’s first Jewish family. It is illustrative and broads trends of social and developmental history of the City. When constructed, it was adjacent to the mansions of the wealthy and was considered a prestigious address. ·	and Samuel Diamond’s niece, Martha Cohen, and her husband Harry Cohen, who lived here from 1947-59. Harry Cohen was manager of General Distributors Ltd., and later became manager of Sony of Canada Ltd. Martha Cohen is the namesake of the Martha Cohen Theatre in Calgary’s Performing Arts Centre. The architect is not known at this time, but evidence points to Alexander Pirie, an architect of considerable importance who designed the Devenish Apartments, St. Regis Hotel, and Calgary Prophetic Bible Institute. It was built on two of three lots that had been owned by Martin Kavanaugh of Iroquois, Ontario. Samuel Diamond (circa 1889-1974), owned the property from 1929-1949. The President is an eclectic building with references to Classical architectural details including: arched Romanesque windows with balconette on the upper floor; symmetrically placed roof pediments (alternating stepped profiles with curvilinear forms) on all elevations; and front and rear entrances defined by arched openings set in projecting pediments. The building is a wood frame structure with stucco cladding. It is of importance in maintaining and defining the character of the street. The exterior is intact, except for small windows covered over. - Thank you to the Calgary Heritage Authority, and also to CHI's Kristi Johnson, who did initial research. Update on the this building is that it has been refurbished with a coat of brown paint on the outside and replacement windows. Slowly being rented. Small studio apartments with a kitchen and bathroom and one large room for living/bedroom. Floors were sanded and refinished. I have re-posted your post in the "President apartments redevelopment news" thread in Development Watch. That way the update will pop up on on the "Latest Updates" display. This thread is pretty much an archive back from when the President was a "featured historic site" on the front page. I think I'll lock this thread and direct the updates and discussion to the other thread, which is more current. Thanks, altascribe!